CLICK BUTTON TO SEND YOUR FILES! 22 MIL, 400GSM POLY-COTTON SOLVENT CANVAS. ARCHIVAL CERTIFIED, OBA-FREE. Urth™ is the world’s first solvent canvas with archival certification. It is a 400gsm white poly-cotton blend matte canvas. Specifically designed for the high-end fine art and photographymarkets, this canvas utilizes our "Chromata White" optical brightener additive-free and Fluorescent Whitening agent-free breakthrough technology. "Chromata White" gives the end-user the most stable platform on which to print photographs and fine art works without the metamerism issues or color shift issues inherent on other canvases. Optical Brighteners compromise the attainment of true color, they complicate profiling accuracy, and they inevitably deteriorate and yellow over time.Ever noticed how a print can look identical under one light source, yet show remarkable differences in color when viewed under a different light source? This problem is referred to as "metamerism". When OBA's are used in inkjet media, the metamerism problem exacerbates exponentially. Because this product is manufactured OBA-free, you are assured that your prints will look consistent under different lighting conditions. Solvent Canvas is a 400 GSM bright white poly-cotton blend canvas that is specifically designed for the décor market. It is a no frills, low-cost alternative that still delivers exceptional print quality. It is ideal for short-term photography, fine art reproduction, indoor signage, backdrops, murals, and more. Solvent canvas is manufactured with large amounts of Optical Brightener Additives which give it a high white point, wide color gamut, and high Dmax value. It is highly durable, water proof, and scratch resistant. We always staple on the back for clean looking edges which can be framed or left alone as a gallery wrap. 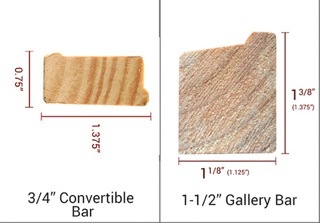 Since the strips we buy in bulk are 12’ long we always have stock available and are not limited to certain sizes at all.Our stretcher bar moulding is made from high-quality pine, ideal for stretching canvas and will not warp or shrink over time. Alongside quality, our primary concern is respect for the environment. For this reason, we only use wood sourced from sustainable forests which are all FSC certified. This 300g, bright white, cotton rag-based water-resistant textured matte paper is acid free and lignin free. It is a 50% cotton blend and was specifically developed to be a lower cost alternative to 100% cotton rag fine art papers. It delivers remarkable print quality characteristic of all Breathing Color products. Decor watercolor has a luxurious cold-pressed textured surface designed to maximize resistance to scuffing and flaking. Vibrance Gloss is a heavyweight glossy photo paper, developed for the discerning photographer who demands maximum color gamut, Dmax, and image resolution. Using a cockle-free RC base that gives the product a true photographic feel, Vibrance Gloss allows for maximum ink coverage and produces stunningly vivid images. It has an instant-dry surface which allows for easy handling during production and finishing. 230GSM PHOTO QUALITY MATTE PAPER. HIGH DMAX & COLOR GAMUT. Vibrance Photo Matte was designed to deliver stunning, photographic print quality into the lower cost smooth matte paper segment. It has a bright white surface and is ideal for photographers who require a no gloss, luxurious flat matte surface to bring out the beauty in their images. This high-quality photo paper is 9 mil thick with a satin finish. It was developed for the discerning photographer who demands maximum color gamut, Dmax, and image resolution. Using a cockle-free RC base that gives the product a true photographic feel, it allows for maximum ink coverage and produces stunningly vivid images. It has an instant-dry surface which allows for easy handling during production and finishing. We always stock 1/4” clear 4x8’ acrylic sheets in our studio. Other thicknesses can be used with slightly different costs and a bit longer timeframes. Directly competing with face mounting, the UV direct printing in reverse offers half the cost and because there is no clear adhesive membrane there are never any specks or bubbles. With color, white, and color layering the colors pop rivaling an 8 color process while only using 4. The white ink allows for not only great opacity but can be used as a spot color for added dimension. Since the ink is not protected on the backside we offer a light diebond or sintra sheet to back it which can allow a frame back with wire to adhere to it safely. The frame back literally pops the image off the wall by up to an inch so no framing is needed.